My older daughters go to Hebrew School at our synagogue three times a week. They learn to read and speak Hebrew, they learn Jewish prayers and Jewish history, they learn about holidays and about Israel. Most of all, they develop a strong, positive identity as Jewish people. In response to their request I began searching for some Hebrew-themed fabrics I could use to make the bags. This search led me to two discoveries. First, I’ve realized that there’s a serious lack of sophisticated, modern, tasteful Jewish fabrics on the market. I get it. Jews make up just over 2% of the American population. It’s not a big market. But we live in an age of self-publishing so I felt surely Spoonflower would offer a better selection of print-on-demand Judaic fabrics. I found just one that was really lovely, but it had a pretty strong Hanukkah theme. Spoonflower fabric designed by Alicia Vance. So my first conclusion was that the selection of Jewish-themed fabrics on the market is very poor. My second discovery was Fay Nicoll. Fay owns Sunshine Sewing, a quilt shop in Margate, Florida. A few years ago she began designing Judaica-themed quilts and selling the patterns and kits in her shop. She also had a fabric line. Here she is in 2009 at spring Quilt Market in her first booth. I love this video. And I love her work. This quilt is really beautiful and a far cry from the tacky, old-school stuff that seems so common. 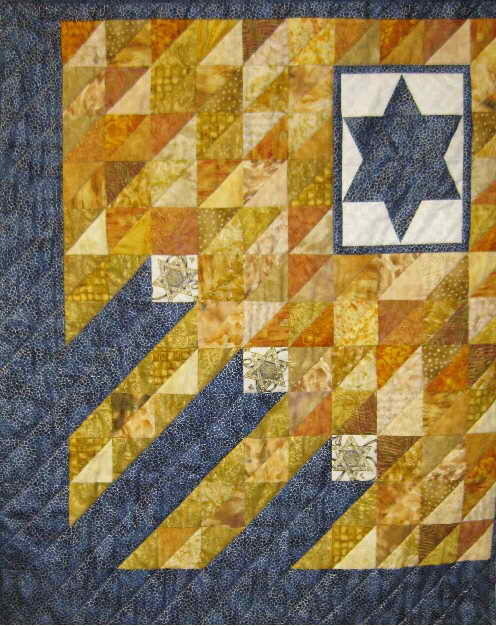 Judaica Rising quilt designed by Fay Nicoll. She’s got an Etsy shop. 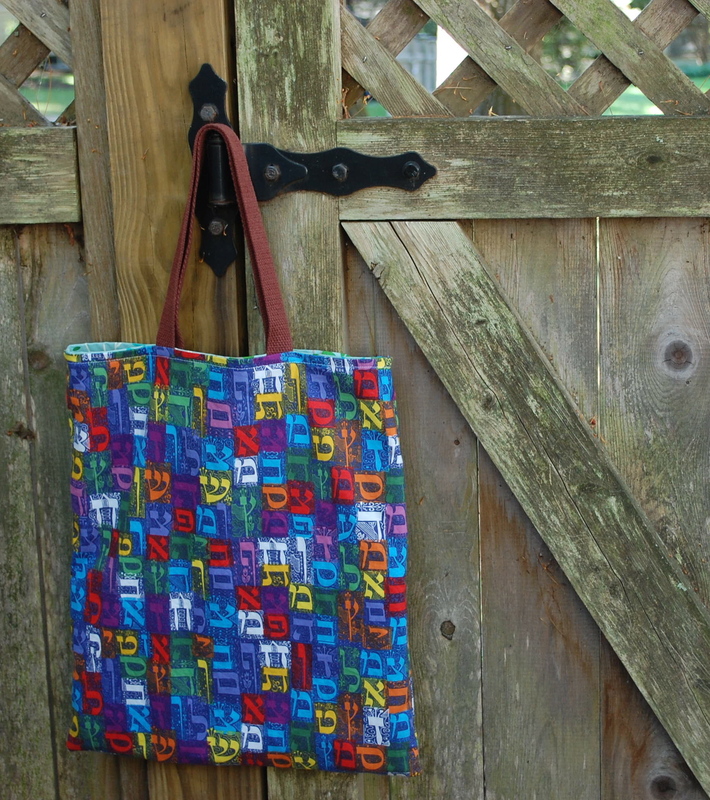 I bought a yard each of her cotton Aleph Bet prints in different colorways, perfect for Hebrew School bags. Why is all of this important? There’s a wonderful concept in Jewish culture called Hiddur Mitzvah which says that beautiful things contribute to our enjoyment of life. I think this can apply to anyone’s life, no matter what culture or religious background you come from. Let me show you something that exemplifies this idea. 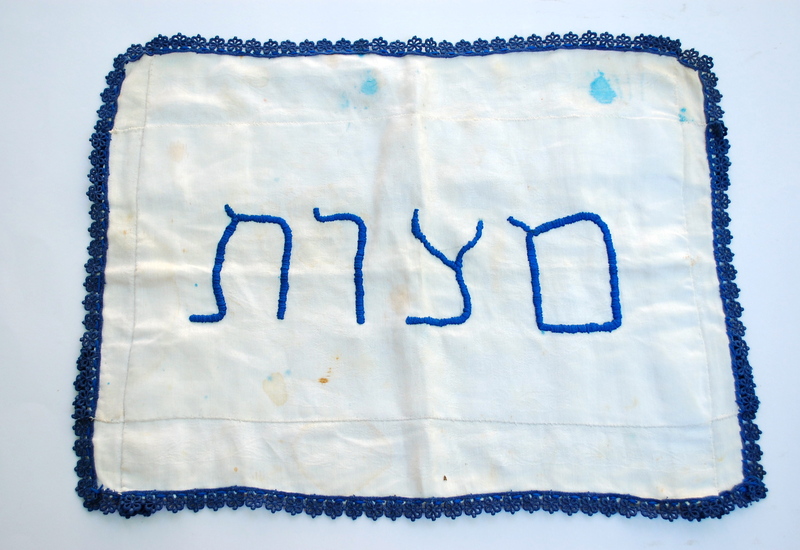 This is the matzah cover we use at the Passover seder (it says “matzot” in Hebrew, the plural of matzah). You can tell it’s been on the table at many, many seders. Charlie’s grandmother, Victoria (whom he called Gonga), made it. She died long before I met Charlie so I never knew her, but our eldest daughter’s middle name is Victoria for her. And that is one way that I know her, that our daughters know her. It might seem romantic, but the things we stitch with our hands are the tangible things that we leave behind, and they’re a big part of how we’re remembered. Using this matzah cover makes our Passover seder more beautiful. Having a handmade Hebrew School tote from mom makes going to Hebrew School feel good. 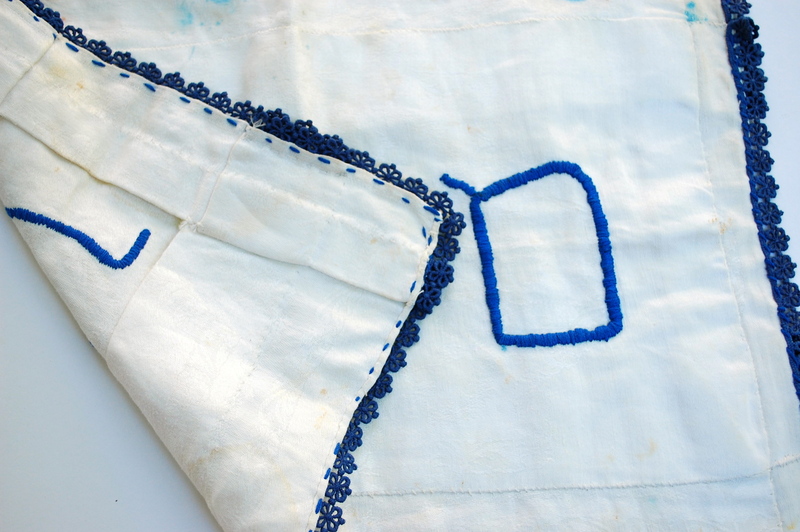 If Jewish women in 2014 are going to sew our own Judaica to use every day, and on special days, we need to breathe fresh life into the available fabrics and patterns. We need tasteful prints that we truly want to sew with, and modern patterns for objects ancient and new. I hope that in this new age of self-publishing we’ll start to see PDF patterns and print-on-demand fabrics that speak to modern tastes and inspire us to sew the Jewish objects that we’ll be remembered by. Wow, Abby, this is a wonderful post. I am not Jewish, but I see the truth in what you say here. I think all of it is true for many of us, in varying ways. What I like most is the illustration of artful vs tacky. Why oh why is tacky even a part of the creative world? Poor quality fabric with obvious and ugly designs in ugly colors abound. My hat’s off to Fay Nicoll. Thanks for sharing the beauty. Thank you, Debbie. Fay Nicoll was a great discovery for me! I hadn’t thought about this until working on an art project where I wanted to incorporate Jewish patterns, and came across none! You’re welcome, Lauren. I hope to add to the repertoire of available modern Judaica sewing patterns at some point soon. 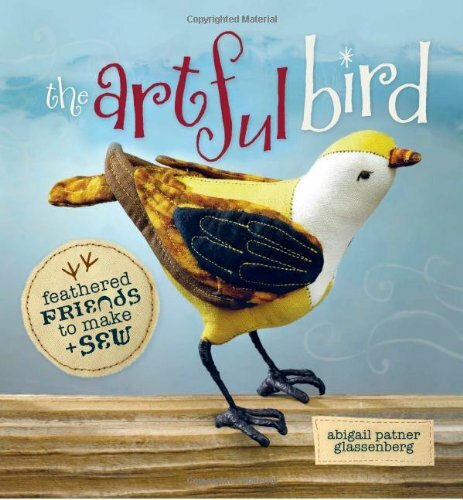 Do you think you will design some fabric and maybe some patterns? I hope to create some Judaica patterns at some point in my design career. 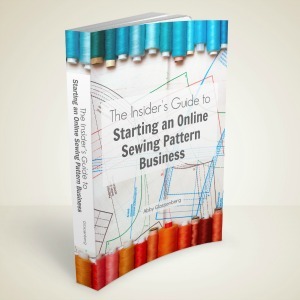 It would be great to facilitate the creation of an ebook in which designers of all sorts of stitching patterns (embroidery, quilting, cross stitch, sewing, etc.) could come together, along with print-on-demand fabric designers, to create an ebook of modern Jewish patterns. Wouldn’t that be amazing? What a great resource, and without the overhead of doing a print book it very well might be possible. Awesome! What an amazing gift that would be for your children, and so many others. I would like to see this come to fruition. A worthy goal! If and when … I’m in. That is totally the way to go. Publishers know there is a lack (same as they know there is a lack of good boy fabric/patterns/ etc.) but when they produce it, it doesn’t sell well and so new pitches often fall on deaf ears. I like to adapt the things my children see and miss out on (I know, I said ‘miss out on’ but that’s how I felt as a child) such as a countdown calendar. I just do it t-minus 2 weeks and we start it then and when it’s done it is the first day of Chanukah. I have been asked by the temple to make modern items to sell in their gift shop – so there is definitely a market, but it is small. Thank you! What a wonderful post. I too have noticed the lack of attractive Jewish-type fabrics. I’d love to find patterns to make my own Judaica and modern, fresh fabrics to make them in. If there was a source, I’d be lining up to spend my money! You and me, both. We’ve got to talk about it, and ask for it, in order for it to ever happen. I think Spoonflower is our best bet. 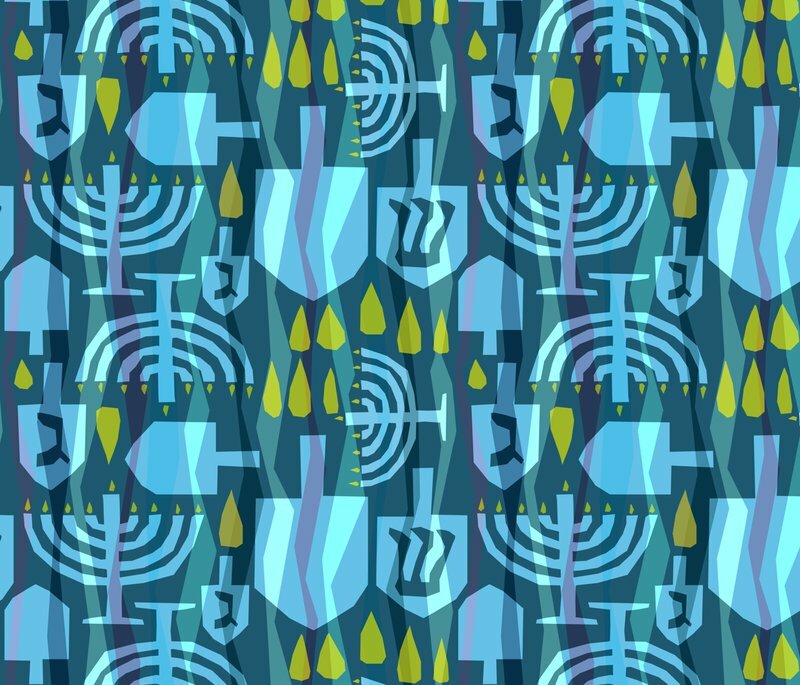 If you know someone who’s skilled at fabric design, encourage them to give a Jewish print a try! Cute little bags for your daughters! Thanks for the link to Fay Niccoll’s shop. It is so important to have beautiful handcrafted items. Many years ago our shul was getting a brand new torah and needed a cover made. No one had a pattern so I had to draft one. My friend and I spent many hours over a period of time working on sewing the torah cover. (They had applique designs that complimented the stained glass in the sanctuary.) We were really happy with how they turned out. I do wish that there were more beautiful Judaica patterns out there. Have you looked into the Pomegranate Guild? They’re supposed to make Judaic needleworks and have chapters across the country, mostly on your coast. If nothing else they may have more interesting pattern sources. 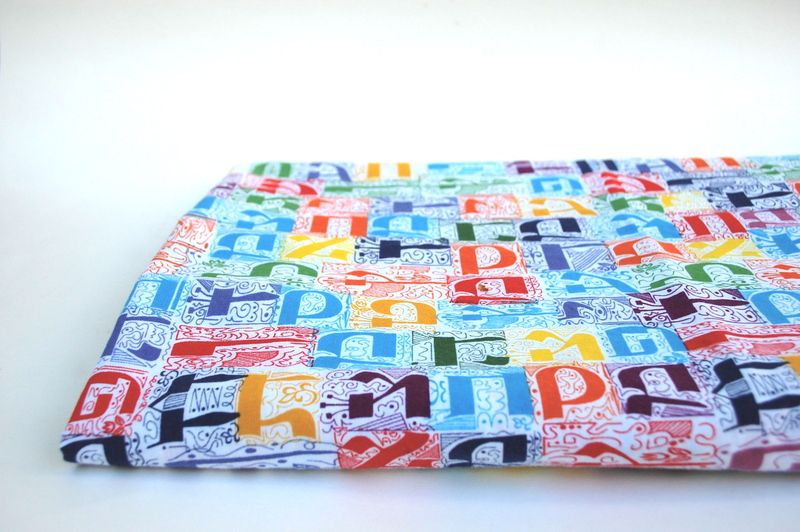 The Aleph Bet fabric would be fun for shalch manot bags for Purim or gifts for religious school teachers. Thanks for sharing. I live in Israel and I don’t think I have ever seen Aleph bet fabric! I love it! That’s so interesting! You’d think that there would be a good selection of text-based prints in Israel, in Hebrew, but I guess not? That’s too bad! Maybe there will be in the future. Let’s hope. What a great etsy shop! I never thought about this lack of Jewish themed fabric. Its a wonder there are not more international designers. I am not Jewish but one summer when Years ago I was working in school summer camps I made a group quilt with my 1-3 graders. I had them write their name and a picture that was something that represented them. then they embroidered them . One 2nd grade girl I remember Wrote her name in both english and Hebrew and it sparked a sharing of culture among our group. As you know I am not Jewish, but I always adore your thoughtful perspective and intelligent writing. I have come to believe that whatever you put our there with intention and enthusiasm will come to fruition. You are always an inspiration! I wasn’t familiar with Andi’s blog, but just found her post with a challah cover that she made: http://www.patchandi.com/2009/07/challah-cover.html Thank you so much for pointing me to her! I know exactly what you mean. I’m a wedding chuppah designer who found myself thinking the same things some time ago, and I”m excited to say that I’ve put together an ebook of Judaica patterns called Sew Jewish that’s coming out in October (just after the High Holidays and in time for Hanukkah gift making). The book has the 18 key Judaica projects, like a tallit, challah cover, and matzah cover. 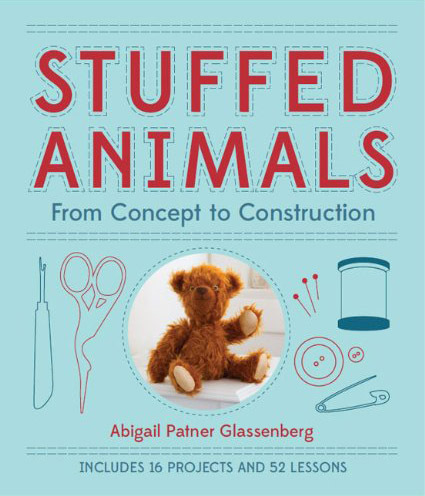 The book is coming out in digital form at the SewJewishShop.com and Amazon.com. 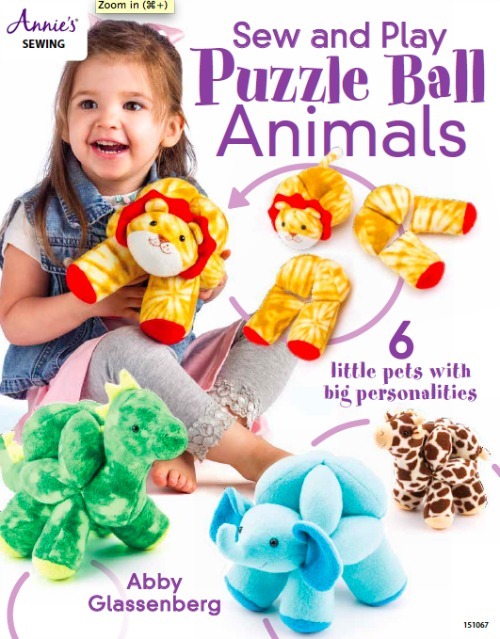 During the past year we’ve also put out some free PDF patterns on the blog SewJewish.com, which I invite you to check out. And I love your idea of a collaborative book with different techniques. Now to get someone designing those new fabrics! I’m so excited to buy your ebook, Maria! Truly! At some point we’ll get some new, modern fabrics on the market, but it helps to just start asking, right? I agree. I live in Israel and I never see aleph bet prints and the only Jewish type prints I have seen online from the US were Magen David’s and menorahs. Thanks for sharing. I think there is a market for some cool softies especially a modern Sefer Torah softie! My kids suggested that! Also, a lulav and etrog with faces. I sewed a Torah softie based on instructions I found here: http://sweetcrunchyjewy.wordpress.com/2011/01/23/tiny-torah-tutuorial/ – definitely worth a look! Thanks for sharing. I ‘ve bought several fabrics from Sunshine and have a lovely kit to make. Even though I am not Jewish, a Christian, I pray for the peace of Jerusalem as the Bible instructs me and love the things that Fay designs. p.s. love the squirrel for Wild Olive. Abby, I love this post! I think my favorite part was the beautiful matzah cover made by your husband’s grandmother Victoria. What a beautiful family heirloom! Thank you also for the links. I love that matzah cover, too. Thank you so much. Please let me know if I can help. I create Tallit sets, Judaic quikts and bris items, and holiday items. Thank you for the recommendations, Roberta. I really appreciate your help. I do have a few requests for Judaic fabrics and gifts ..and Hanukkah prints are only ones available. Thank you for this post and your others- always thoughtful and helpful. I think embroidery machines are awesome and would definitely help in creating our own Judaica, but you’re also right that nothing beats the hand-stitching on a family heirloom. A friend sent me this post…and it is you! Great post. Love the fabrics you found. Thanks, Carrie! That’s so funny. Loved reading this post – and all the comments too! Fay’s fabrics are gorgeous. What a great find! Hope your girls enjoy using their bags. I love the fabric and the bag. Thank you, Ariella, and the same to you. YES! Jewish-y fabric is woefully in need of new life. Also, I love your kids’ ideas of an anthropomorphic lulav and etrog. How CUTE would that be? I’d have to start sewing again. Enjoying all the links and suggestions in the post and comment thread… Joanna. I love your blog, Joanna, and just subscribed! Thank you for pointing me to it. Thank you for this. I am so behind on my blog reading but agree x1000. I’d love to make some Jewish-themed things for my daughter but not out of the traditional novelty prints. I’m off to scope out Fay’s shop! Many, many thanks for sharing the information about this fabric and the website. I will make my nieces string bags. I have the luxury of close proximity to the gift shop at the National Museum of American Jewish History, which I highly recommend, but otherwise beautiful Judaic objects can be hard to find. I’ve been to that museum and it’s wonderful. Lucky you! Abby, thank you for addressing the issue of Jewish fabric, and the important contributions that Fay Nicoll has made in increasing the sophistication of our choices! For more resources on Jewish stitching, check out our Pomegranate Guild of Judaic Needlework, at pomegranateguild.org. With over 500 members internationally, we have an archives available to members that’s full of patterns, history and ideas! 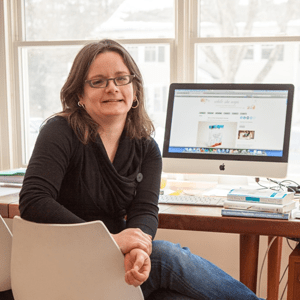 Members receive a quarterly newsletter packed with inspiration. Pomegranate has a yahoo group and closed Facebook page, for members only. In addition, I have a lot of fun ideas related to Jewish sewing and quilting, on my http://www.judaiquilt.com site, and at my blog, http://www.gefiltequilt.com. Thank you for these resources, Cathy. Yesterday I returned home from a two-week visit in Jerusalem. I saw a few text-based textiles among the many fabric stores in the Jaffa-King George area–not far from Machane Yehuda. This is a fantastic post with informative comments to boot. Once I’m fully unpacked and caught up, I’m hopeful I can dive in to some of this.